Seated left to right - Police Officer and President of the Police Union (Lake City Police Club) Kevin Hadcock, Mayor Billy Barlow, Standing left to right - Officer Scott Verberg, Officer Brandon Porter, Officer Eric Shaffer, Sergeant Joshua LaRue, Sergeant Justin D'Elia, Sergeant James DuFrane, and Police Chief Tory L. DeCaire. 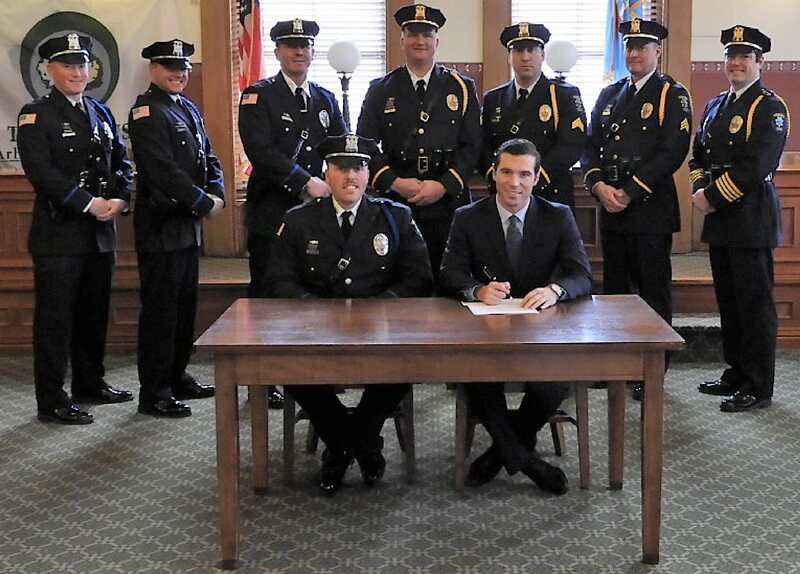 OSWEGO, NY – Mayor Billy Barlow met recently with the Oswego Police Union (Lake City Police Club) representatives to sign a memorandum of agreement. It would provide a mechanism to reconcile the City – Union contract language with New York State Law which allows qualified US Veterans the ability to “buy-back” their military time to use toward their New York State Retirement benefit. Seated left to right – Police Officer and President of the Police Union (Lake City Police Club) Kevin Hadcock, Mayor Billy Barlow, Standing left to right – Officer Scott Verberg, Officer Brandon Porter, Officer Eric Shaffer, Sergeant Joshua LaRue, Sergeant Justin D’Elia, Sergeant James DuFrane, and Police Chief Tory L. DeCaire. Prior to this memorandum, each employee was handled on a case by case basis with no guarantee that the city would allow the member to retire with city earned benefits when retiring under this provision of the law. The agreement states that eligible members of the City of Oswego Police Department will be afforded the opportunity to buy back from the State of New York up to three years of active military service toward their retirement as defined in Article 20 of the Retirement and Social Security Law. An eligible member that utilizes this section to qualify with full benefits as defined in their New York State & Local Retirement tier will be allowed to retire with all rights and privileges which would be afforded a member who has served 20 years of service with the city of Oswego.